The station is powered by an Oregon Scientific WMR 200 weather station. The station is comprised of an array of sensors including an anemometer (wind), a rain gauge, thermometer, hygrometer (humidity) and a UV sensor. The data from the various sensors is then collected and uploaded to a web server. SouthThorntonWX.com is owned an operated by a weather enthusiast and resident of Thornton, Colorado. We have been collecting data since October, 2008 although the website did not go live until April, 2010. The Oregon Scientific weather station console receives data from the various sensors. The station's console is then connected to a Dell Optiplex 620 computer with a 3.2Ghz Pentium IV processor and 2GB of RAM running Windows XP Professional. 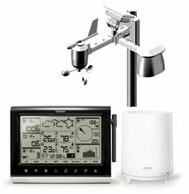 A software program called Weather Display captures all the data which in turn uploads the information to the web server (hosted by Denver Web Host). Significant knowledge and troubleshooting help has also been gained from the awesome users on the Weather Watch forums . Thornton consisted solely of farmland until 1953, when Sam Hoffman purchased a lot off Washington Street about seven miles north of Denver. The town he laid out was the first fully planned community in Adams County and the first to offer full municipal services from a single tax levy, including recreation services and free trash pickup. Thornton was named in honor of Former Colorado Governor Dan Thornton. Today, the City of Thornton is a Home Rule Municipality in Adams and Weld counties in the U.S. state of Colorado and a suburb of the Denver-Aurora-Broomfield, CO Metropolitan Statistical Area. Thornton is 10 miles northeast of the states capital, Denver, on the east side of I-25. The United States Census Bureau estimates that the city population was 113,429 on July 1, 2008, a 37.68% increase from the 2000 Census population of 82,384. Thornton is the sixth most populous city in the State of Colorado and the 221th most populous city in the United States.